My dogs always have a special fascination for whatever is under the deck. I had it closed up pretty well after Foxy kept going under there, but Chewy is a very clever guy. I had no idea what was going on until I couldn’t find him. I called inside the house. I stepped out into the yard and called his name. No answer. I thought I heard a slight jingly sound, like his tags might make, but figured it was wishful thinking. He must have found his way out of the yard. So I went hobbling down the street in my slippers, calling his name. All the way around the park, but no luck. When I got home, my gardener’s truck was out front and I heard a familiar bark coming from the back yard. 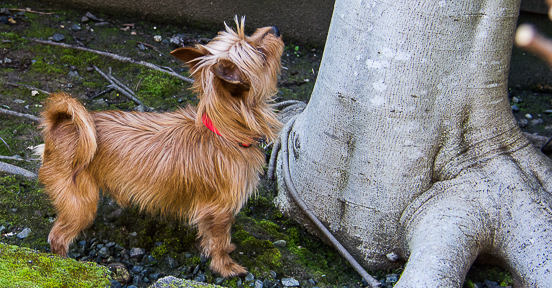 Sure enough, Chewy was under the deck–not interested in telling ME, but eager to bark at the intruder in the yard. We couldn’t find Chewy’s place of entry, but Arturo helped me to get him out by digging a hole in the mud. I picked up the mud-covered pup and Arturo kindly closed up the hole and put some rocks there to discourage digging in the wet earth. I picked him up and carried him through the door, headed for the sink, but he wriggled out of my arms and landed on–get ready for it–the sofa! Ohmygod! Into the sink again, then I had to clean up the sofa and the floor full of muddy footprints. I placed more rocks and boards around the deck and the next day a dear friend came and nailed a new barrier in place, but not before retrieving the blue ball. Chewy could probably still find a way under there, but he no longer has a reason! This entry was posted in dog writer, dogs in the mud, rain and tagged Dogs, winter by Lenore Hirsch. Bookmark the permalink.